When it comes to the floor, it is an essential part for any of inside remodeling projects and with no exclusions – floor design will make a big change for every room in the house. There are different flooring materials to choose from, and it is, mainly, depend on the area in the house which type of floor can be the best option. Lets say, in the kitchen area, hardwood or tile will be the best choice, in contrast, in the bedroom, probably carpet. If it is a master bathroom, any types of stone or ceramic tile can work. Vinyl tile is good for big commercial properties, but it is also an option of saving money on any residential renovation project. Carpet can be easily installed in pretty much all rooms, except, probably, bathroom and kitchen. In heavy traffic areas, in order to protect carpet from dirt and excessive wear, it is a good idea to put area rug on top. Tile is a most durable flooring option. It will stay many years with a little care. Hardwood floor is very popular flooring material but can be easily scratch or damaged by water, and require more care. Good thing that solid hardwood can be refinished and stained in the variety of colors. Laminate is alternative to the hardwood. It is much cheaper and easy to install. It has very high impact and stain resistance and very popular in rental properties. In history of flooring materials we can find many interesting and sometimes very surprising things. For example, one of the earliest carpets in the world dating from the 5th-4th century BCE. A bamboo is also a very old flooring material since the Ming dynasty of China first advocated it to use in the period between 1368 and 1644 A.D. However, this type of flooring became not that popular with invention of a hardwood floor at that time. It regains its popularity only about from 1990’s. Other an interesting fact is that in the Baroque era (the period between 1600-1700’s which means "a pearl of irregular shape"), people start to use wood flooring for normally upper floors. Of course, only rich and royal people could afford it. Tongue and groove flooring was innovated in the 17th century; however, they did not become popular until early 1900’s and when they did, it was only for the relatively short period of time. In 1684, a parquet floor was introduced in Versailles, France. So, wood flooring and parquet floors were very common and popular until the end of World War II when the advent of carpeting manufacturing made it possible for people to acquire carpeting to cover the wooden floors. The hardwood floor was brought to use and became popular in about the late 1700’s. In the early 1800’s in colonial times, the wood floor became even more popular because in ‘the new world’ there was much easier to get wood from wild and untouched forests compare to limited Europe. The mass production of this type of flooring started at the late 1800’s during the industrial revolution. However, normally these floors were still unpolished, unstained, and unfinished. In 1834, Americans started not only importing carpets from other countries but producing them also. Surprisingly a linoleum floor is also very old type of flooring. Despite the fact that many people might think that it is relatively new and/or modern, but in fact, linoleum floors have been introduced to public since 1860. First linoleum was invented by Englishman Frederick Walton who wanted to find some alternative to hardwood flooring. Cork is not a new flooring material also; it can be traced back to ancient Egypt. Originally in the 18th century, Dom Perignon used cork for champagne production. His significant discovery of cork has led to many other uses of this material. As any other flooring material, cork also has its ups and downs in popularity throughout the years. 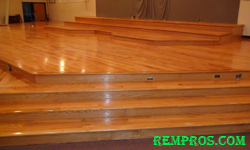 Premanufactured, prefinished wood flooring that does not require any stain and finish to be applied on it was introduced to public in about early 1900’s. It earns its popularity not only because it is a beautiful but also a functional flooring material that has comparatively an easier installation and maintenance process. After 1945, when the World War II ended, the new houses were built for returning veterans’ and according to the government program, the cost of carpets were included in the home loan. That’s why hardwood flooring started to lose its popularity and carpets, in contrast, had rapid boom at that time. Carpets were popular also because of their durability, colors and beauty. In the 1950s, linoleum was considered to be an excellent, inexpensive material for high use areas because of its ease of installation and maintenance. In addition, it was softer compare to some other floor materials and plus it is water resistant. With the introduction of easy to maintain floorings during the 1950s, the interest in cork flooring increasingly declined. However, cork flooring was again back in vogue during the 1970s and now. Laminate wood flooring was invented in 1977 by the Swedish company Perstop and marketed under the name Pergo. It was a cheaper alternative compare to more expensive hardwood flooring. Since the 1980’s prefinished groove flooring regains its popularity and with the house boom of the 90’s, the hardwood floor became very popular once again. At that time the engineered floor was introduced to the public and gained popularity of customers right away. In addition to the usual laminate wood flooring, glueless laminate flooring was invented by Belgian company Unilin in 1997 and became the easiest installation system available even for do-it-yourself projects.